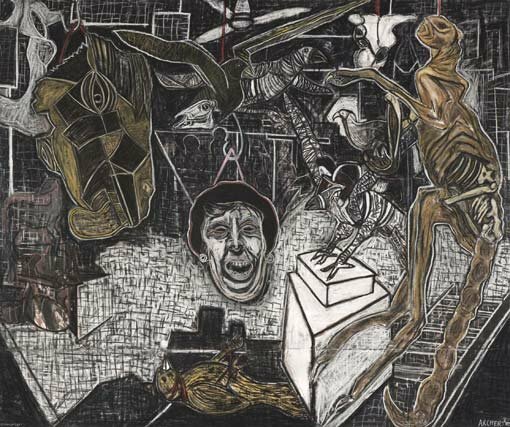 It was announced today at the Art Gallery of New South Wales that Suzanne Archer is the winner of the 2010 Dobell Prize for Drawing for her work Derangement. Suzanne Archer was awarded $25,000 for winning Australia’s most important prize for drawing. This year there were 635 entries, of which 45 are included in the exhibition. The subject of the winning drawing is a self-portrait of the artist in her studio. At either side of the central form of her face are some of the objects she has gathered there: a desiccated kangaroo and a sculpture of a horse’s head the artist made from wood found in the nearby bush. It is part of a larger body of work that has arisen from drawings Archer made of animals at the Veterinary Science laboratories at Sydney University in 2004, as well as of skulls and bones collected near her bush studio, and from a developing awareness arising out of her relationship with these animal remains, of her own mortality. Suzanne Archer is a senior painter, sculptor, printmaker and teacher who has lived and worked at Wedderburn in the south-west Sydney region since the late 1980s. Born in 1945 in Surrey, England, she studied at Sutton School of Art prior to migrating to Australia in 1965. She has exhibited widely since the mid ’60s, was granted residencies in New York and Paris in 1978-79 and has won numerous awards, including a fellowship from the Visual Arts Board of the Australia Council in 1993 and the Wynne Prize in 1994. She has been a Dobell Prize finalist three times (in 2000, 2002 and 2009). The Dobell Prize for Drawing, initiated by the Trustees of the Sir William Dobell Art Foundation, is an acquisitive prize, first awarded in 1993. This year’s judge was Alun Leach-Jones. Alun is a Sydney painter, draughtsman, sculptor and printmaker. Alun Leach-Jones comments: the work is expressive, darkly poetic and full of drama. There is an ambiguous narrative, alive with vivid and sinister images that are depictive, symbolic and metaphoric. The subject of drawing is drawing itself. Suzanne Archer’s winning work clearly shows her awareness of this profound aspect of the art of drawing – regardless of its apparent subject matter.